Members of the Golden Statre Warriors can't wait for their teammate Stephen Jackson to be traded. The headlines will tell you that the Warriorswent off for 146 points Monday night in a win over the Timberwolves. But before the game, the Warriors went off just as hard on their malcontent teammate Stephen Jackson. "The Jax situation is a constant distraction,” one member of the Warriors roster anonymously complained to Yahoo! Sports. At least the players are still on "nickname" terms. “Once they trade (Jackson), it will clear up a lot of things,” another Warriors player said off the record. The Yahoo! Sports report also states that Jackson has told his Warriors teammates that he doesn't feel like a part of the team anymore. Saying "I’m in a good mood right now after getting beat by 60," to the Santa Rosa Press Democrat will do that, Stephen Jackson. Jackson has been in full-court "Trade me!" mode since August. He claimed to Yahoo! Sports that 10 NBA teams were interested in trading for him. "I just want him out of there now," Jackson's agent Mark Stevenms told ESPN before Monday's game. "It doesn't matter where." "I hope his lawyer says something negative about me (today). It must have turned him on," Warriors coach Don Nelson laughed to the San Jose Mercury News after Monday night's game. Jackson had 15 assists in the win. 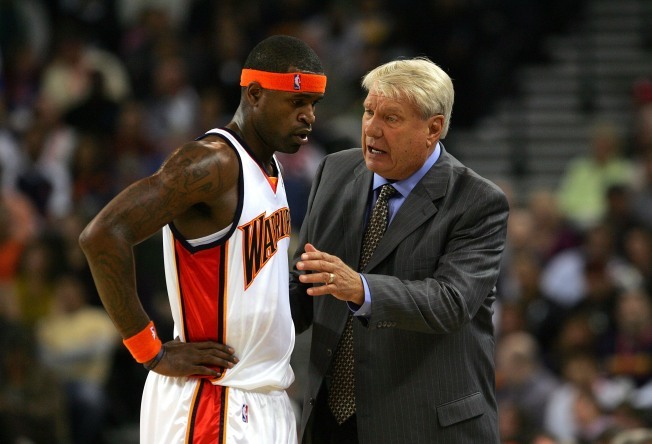 Joe Kukura is a freelance writer who is surprised that after 33 years coaching in the NBA, Don Nelson doesn't know the difference between an agent and a lawyer.